Networking for the geekishly inclined. Typing. Something we do every day and mostly take for granted. That is until our keyboard starts acting crazy. Keys don’t register, they get stuck, or they just double register. Either way it’s annoying and that’s exactly what started happening to me. Again. 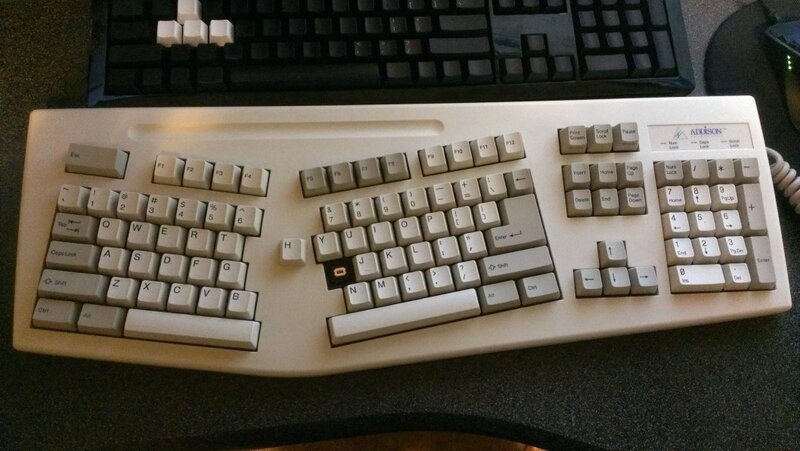 I started thinking about the keyboards I’ve had over the years and I realized that in the last three years I’ve replaced my keyboard at work three times including this latest incident. I don’t know that I’m overly hard on my keyboards but they get a LOT of use. To be fair, the keyboards I’ve been using are the ones from our PC manufacturer and buying them tends to be an afterthought in the ordering process. Mainly because we’ve got so many laying around from previous generations of desktop purchases that they’re more of a disposable commodity than in previous years. Which got me thinking… Have I ever had a favorite keyboard? Thinking back, it’s obvious to me that actually yes I did have a favorite keyboard… and surprisingly enough it was one I had almost 20 years ago. All I could remember was it was an addison keyboard and it was kind of split in the way of the ergo keyboards. I did some google searching and found it! The KB-7001. This keyboard lasted almost 7 years before it’s PS2 port shorted out one day. After I found it of course I had to ask myself why it was my favorite keyboard and after a few moments of reflection I realized it was the keys themselves and the tactile feedback. The clicky clicky if you will. This is important for a few reasons… First off this old keyboard used what was called white alps switches which were mechanical in nature. They gave off a satisfying click when pressed all the way and you could feel it when they actuated. They were done in a way that made you feel like you were a typing king of speed. This led me to doing research into “mechanical keyboards”. In hindsight I should have realized that mechanical really just means “like they used to make them” because back when I started there was no such thing as a membrane or dome style keyboard. Nearly all of todays keyboards (minus the mechanical market) are made with a mass production mindset and the keyboard you’re most likely typing on now is the result. Spongy typing, prone to wearing out, and overall quiet and non-obtrusive to other workers. I’m not a statistics guy by any means but I’ve read and agree with others that keyboard typing speed potential in the past 15 years has been reduced significantly due to the cheaper keyboards that people are mostly using. So what to do. I researched the current generation of mechanical keyboards and read all about the cherry mx switches and the different versions. In a nutshell the most popular ones are blue, black, brown, and red. Blue being loudly clicky and tactile, brown being tactile but not overly clicky, black being neither clicky nor tactile but very stiff, and then red switches which are like the black switches only much easier to actuate. TLDR; Typists go with blue or brown and gamers go with black or red. As the mechanical keyboards vary in price by a huge margin ($50 to $300+) it meant I had to evaluate exactly what I was going to be using the keyboard for. My first impulse was to go with a gaming keyboard as it’s the best of both worlds and I’m a gamer by heart. However, since the red switches do not have tactile feedback and this was for work I knew the choice was going to have to be either the blue or brown. Since I have my own office and the nostalgia factor was too great to worry about a little noise, I went with a full sized keyboard that has Cherry MX blues. . Overall however, I’ve had this keyboard a little over two weeks and so far the difference to me has been amazing. Sure it’s loud and sounds like a machine gun at times when I’m really getting into the typing groove but I’m reliving nostalgia every day and I love it. The one thing I could not predict when purchasing this keyboard is the effect it’s had on others in the office. I’ll be happily typing away and a random co-worker will pause by my door or even drop into my office and just stand there for a minute before commenting on a memory or reflection that the sound has rekindled from their past. It’s funny how something so unassuming and technically boring can bring back such strong memories and feelings from earlier times. If something as simple as a mechanical keyboard can do that then what else are we taking for granted that can do the same? When I started doing communications (the precursor to the networking arena) over twenty years ago, a lot of everything that took place was considered offline or service based. The closest anyone had to a social experience with the computer were the paid services such as AOL, Prodigy, or Compuserv as well as the free services provided by local BBS’s (Bulletin Board Systems) . As my family did not have the income to support a paid service I found myself going the free route by heavily entrenching myself into the culture and intrigue of BBS’s. It was amazing to me that any one person could use a computer, phone line, and a modem and provide or utilize a service so amazing that people would continue to call in and use it day after day, week after week. One person seemed to never having enough time alloted per BBS per day to play all the games, participate in the message boards, or download the latest shareware/freeware available. Some BBS’s even had multiple computers with multiple phone lines tied together so that several users could “chat” with each other in addition to the sysop (The bulletin board’s system operator). I could have never imagined that the social experience provided by this one feature would be so integral to the society of “the future” but thats another story. As was inevitable, at least in hindsight, I found the lure of the unknown too great and had to open up my own BBS as well. With some creative convincing on my part towards my parents that this was “going to help my education”, I was provided my own phone line and given the $15 needed to license the bulletin board software of my choosing. What occured over the next two years was nothing short of magnificent in my eyes. If i was to go back and count the number of people I met and made friends with over that two year span, I could easily fill this blog with names and memories for the next several months. Even to this day some of my closest friends were met through my time running the “Ten Forward BBS“. My significant other Randi was even part of this close knit group. Before you ask, yes I was a huge Star Trek fan, and yes I still am to this day. I even remember the number everyone used to dial my system. It was such an integral part of my life I’m not sure I will ever forget it. Ironically enough it was the internet that killed my BBS and opened the door to what would eventually become my current life. This new company opened about 30 miles from our city and was the first internet provider in our area. I found myself once again talking my parents into paying for a monthly subscription to this new amazing world “for my education”. Back then everything was text based. The Internet yellow pages was actually about the size of a normal city phone book. There were these really cool service names like gopher, veronica, ftp, and irc. I didn’t know what they were but I had to find out. The unknown was calling me. I found myself online all the time and eventually the bulletin board became a “while I was sleeping or at school” service. Friends would call and complain, other BBS operators were unlinking mine because they weren’t getting nightly updates. Finally I closed the doors and gave into the inevitable. The BBS days were numbered and this new internet thing was the future. I spent more time than I’m really willing to admit learning about how the internet worked. I read way too many books, asked more questions than I can count to the various internet message boards, and just explored everything I could. I even managed to find a way to “hack” my ISP’s password file so that I could continue online with other user accounts when my time limit was reached. When the first graphical web browser was released things went crazy, at least to my eyes. The amount of web pages being created and people who wanted to be online was amazing and I couldn’t take it anymore. I had to be a part of it. When I heard that a few local investors were looking for someone who could help them open up a new local ISP I jumped at the chance. I was in college at this point but left because of the opportunity. I did come back and help teach a web marketing class at one point but that too is another story. I could go on and on about everything I thought I knew but didn’t. I could talk about all the drama and business successes and failures that took place over the next three years but I won’t. I could even talk about the first friends who became enemies with the redemptions that occured years later but that’s not for this post. Suffice it to say, life happened, and over time I found out that it’s not just about the experiences of the moment. It’s about being prepared to experience the moments of the future as well. At this “moment” I find myself happily working in the networking arena while also enjoying life in general. I do know that eventually things will change at some point and I can only hope I’ll be ready and that it goes positively. Until that time comes, I will continue to grow and learn from my experiences while looking forward towards the unknown. I know it will be magnificient. I’ve never done a blog before. I never really intended to. So, a co-worker asked me one day why I never actually posted “any of this stuff” online. By stuff I know he means all the information I’ve given out over years while explaining why something works, how I figured things out, my story of how I actually ended up in networking. Even a place for the occasional stupid joke I heard that was only funny in a geeky sort of way. Governor Gecko on To be there… or not to be.